Birthplace of the cinematic legacy of Federico Fellini, Italy has long produced some of the world's most celebrated films. The broad range of filmmaking styles is testimony to the array of talent exhibited by Italian directors. While it is hard to choose favorites among so many classic films, we've put together a list of the Classic Top 10 Italian Movies. 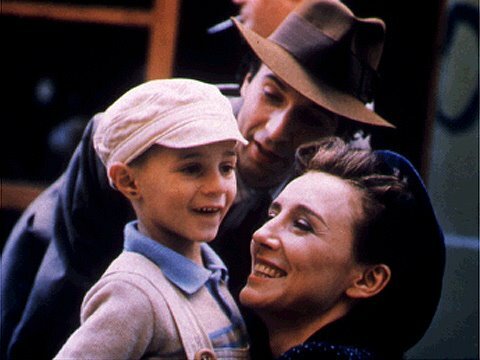 Winner of 3 Oscars, La Vita è Bella or “Life is Beautiful” tells the story of a Jewish shopkeeper living in Italy in the 1930s. Guido has a fairytale romance, marrying a beautiful woman from a nearby town. The lovely couple has a son and the family lives together in utter happiness until German forces arrive to occupy Italy. Sent to a Jewish Concentration Camp, Guido must use his usually blissful life outlook to help his son survive the horrors of the war- imagining that the Holocaust is all a game. When the famous Chilean poet Pablo Neruda is exiled to a small Italian island for his politics, his presence is accompanied by a huge increase in mail to the tiny outpost. The town hires a sweet but simple fisherman to become Il Postino (or “the postman”) and hand deliver the extra mail. A friendship soon develops between the two men as il postino develops a love of poetry. With Neruda’s help Mario sets out to woo the island’s most beautiful girl with his own poems. Winner of two Oscars, in this autobiographical story Fellini explores the ups and downs of filmmaking. A director named Guido struggles to come up with a new idea after completing his latest hit. He is faced with endless requests from past colleagues and employees. Seeking inspiration, he tries to find a few peaceful moments to reminisce about his childhood and lost loves. The family pawns their bed sheets for a bicycle and Antonio finally finds work putting up posters all over Rome advertising Rita Hayworth movies. His first day on the job, Antonio’s bicycle is stolen while he turns to put up a poster. He chases after the thief to no avail and must ask the police for help. After being told there is little that the official must do, the poor man enlists the help of his son Bruno to wander the streets of Rome looking for the stolen bike. A series of misfortunes leads Antonio to contemplate stealing a bike himself, bringing the tragedy of Ladri di Biciclette (or “Bicycle thieves”) full circle. In Cinema Paradiso, a famous film director returns home to the birthplace of his love of movies after 30 years away. While home in Sicily, Salvatore Di Vita reminisces about his childhood at Cinema Paradiso where the projectionist helped him discover his passion for film. Told through a series of flashbacks, Salvatore realizes why he left his small village but longs for the old moviehouse and pines for his lost love. Winner of an Academy Award for Best Foreign Language Film, La Strada (“The Road”) tells the story of a poor girl sold by her mother to a traveling strongman. Gelsomina suffers abuse from Zampanò while serving as a clown for his street performances. She soon meets Il Matto ("The Fool"), who confuses her by suggesting that perhaps Zampanò mistreats her because he loves her. The three performers cross paths several times until tragedy strikes and Gelsomina can no longer bear the physical and emotional stress of her life on the road. Set during World War II, a group of Italian soldiers is sent to a small Greek island and tasked with spotting enemy ships. Since the isle seems abandoned, the soldiers relax and forget their duties until an enemy ship destroys their only means of escape. Realizing that the hapless soldiers are harmless, residents who have been hiding in the mountains return to town, revealing that the island is far from deserted. The soldiers find that being posted to a sleepy Greek isle is one of the best things that ever happened to them. Set in Naples during World War II, Martrimonio all’Italiana (or “Marriage Italian Style”), stars classic beauty Sophia Loren as Filumena, a prostitute and mistress. She meets Domenico, a successful businessman, and begins a 22-year affair with him. Filumena is installed in her own apartment and spends the next years working for Domenico’s bakery. When Filumena learns that her lover plans to marry one of his young employees, she tricks him into marrying her instead by telling him she is near to death. Domenico annuls the marriage, only to be told that Filumena has secretly raised 3 sons, one of which is his. The businessman must then decide whether or not to stay with his former mistress, all the time seeking to discover which boy is his own son. Marcello is a suave journalist who spends his days rubbing elbows with the rich and famous who flock to Rome. He becomes star struck when he crosses paths with a voluptuous actress and feels himself floating away from his dedicated girlfriend. Shocked by the suicide of his close friend, Marcello must decide whether to continue with his frivolous lifestyle or look for a more meaningful existence. Publishers, priests and pregnant women join together to resist the Nazi occupation of Rome. High on the Nazi's most wanted list is Giorgio Manfredi, who is hiding with the help of friends under an assumed name. Tragedy strikes when Manfredi is discovered and forced to flee the city, right into the arms of his untrustworthy mistress. For more suggestions, or to add your own, check out the Best Italian Movies in our Italy Mag forum.